Your staff is the lifeblood of your practice and, as a business owner, it makes sense to improve their well-being and productivity any way you can. To be more accommodating to his staff’s productivity and attract new employees, Scott D. Edelman, a 19-year MDRT member from Yardley, Pennsylvania, decided to rebrand his practice from top to bottom. In the process, he completely remade his office, shifting from a stuffier, law-firm-like look to a fully contemporary style with comfy chairs, chrome finishes, glass desk tops and even in-office paddleball areas for employees to blow off steam. 1. Switch your employee reviews from yearly to quarterly. Employees dread their yearly evaluations like a trip to the dentist. Noting her staff’s stress level when review time approached each year, Vanessa Y. Bucklin, a five-year MDRT member from Conrad, Montana, swapped the tension-filled annual review with a quarterly check in. Trying to cram a year’s worth of notes into one meeting is challenging as well; meeting quarterly allows you to discuss things when they are fresher in your mind and more easily correct course if an employee is struggling in a certain area. “It turns into more of a conversation and goal-setting versus a dreaded evaluation,” Bucklin said. 2. Provide breakfast every day. Face it: Nobody in the office gets anything done in the morning until they’ve made their coffee and rummaged for doughnuts. For Tristan Karl Robert Hartey, a four-year MDRT member from Oswestry, England, this played out among his staff, until he found a way to expedite the whole process: have a hot breakfast at the ready for everyone when they come in to the office. Since establishing this, Hartey has found employees now actually show up early for work, and are at their desks and productive sooner. If that seems like too much work, at least switch out your Keurig for a commercial coffee maker. The faster they get their coffee, the faster they return to work. 3. Circulate an anonymous employee satisfaction survey. Giving employees a safe channel to leave feedback — both positive and negative — can illuminate areas of need in your office and provide you with specific suggested solutions. The cost to implement this is minimal to nonexistent, there’s no real downside and the reward can be great. How can I improve my engagement? How can leadership improve my engagement? You could also create a staff committee to review suggestions that come from the survey before they are passed on to management. If you allow this process to play out and incorporate some employee ideas, your staff will notice. “After a year, employees started to recognize that changes were being made, and they appreciated the difference,” Spencer said. 4. Take off the ties. Here's a simple one. Hartey not only doesn’t require his employees to wear ties to the office, he doesn’t even let them. This has created a more relaxed atmosphere, and when the staff is more comfortable, they are more productive. 5. Keep your weekly meeting short and provide a takeaway. The feedback is just about universal on this one: When it comes to staff meetings, the shorter, the better. John R. Benton Jr., CLTC, a 13-year MDRT member from Warren, New Jersey, who refers to his meetings informally as “huddles,” has a solution for when they drag on: He sets a time limit for each staff meeting and assigns a specific timekeeper to keep tabs. When time’s up, the timekeeper literally ends the meeting. For his part, Edelman doesn’t have traditional meetings. In their place, he holds lunch and learns, which he finds enrich his staff more. “It gives us time to think and talk and get away from the business,” he said. Topics can be anything the staff will benefit from, not just industry-specific issues. Recent examples have included cybersecurity safety, CPR training and a Microsoft Excel tutorial. 6. Reach out to employees’ families. Proactively reaching out to staff members’ spouses with compliments about the employee’s work has far-reaching benefits, according to Spencer. He periodically contacts family members, either by calling them at home or pulling them aside at a staff event, to cultivate pride and good will that pays off down the line by creating advocates for his firm. That way, the next time an employee has a bad day at the office, their spouse will encourage them to go back to work in the morning as opposed to dwelling on it or looking for a new job. “If someone is a little disgruntled and wants to vent about it at the dinner table, if you have included their spouses and been kind to them in the past, they are going to say, ‘Get over it,’” Spencer said. Spencer recalled a situation five years ago in which one of his employees was not pleased with a raise she was offered. She went home and grumbled about it to her husband, who Spencer maintained regular contact with. The husband’s response: “You don’t know how lucky you are there. They are great to you!” The employee is still a key person in Spencer’s office today. “And she’s never complained about anything further,” he said. It became increasingly clear to Enright that the atmosphere in the office, from the dark colors to the heavy decor to the lack of sunlight, was not conducive to the kind of practice he wanted. So, in 2016, Enright decided to move to a new office that would be custom designed to create a fun, inviting environment that would better serve both clients and employees. 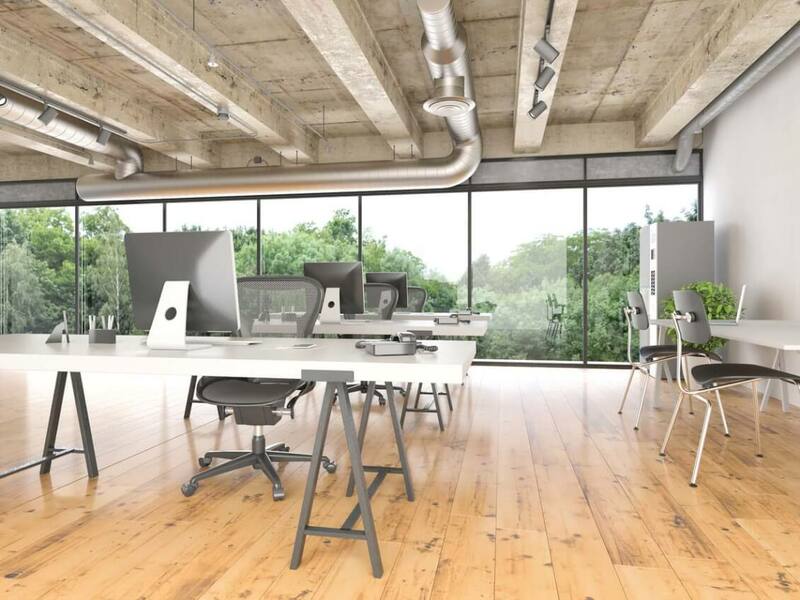 The new office space has high, white ceilings; desks that go up and down with a push of a button; exercise equipment such as steppers and balls; and glass conference rooms with expansive views of Syracuse. Team members’ work areas include a seat built into the furniture to encourage collaboration, two screens on arms they can move around to show others what they are working on, and partial walls that give some privacy but allow for discussions.